The National Institute on Aging—Alzheimer's Association guidelines for the neuropathologic assessment of Alzheimer's disease provide clarity to primary care physicians regarding the diagnosis and treatment approach for patients with Alzheimer's disease and highlight the need for regular follow-up and management. In this complex setting, the guidelines from the National Institute on Aging-Alzheimer's Association create an opportunity for primary care providers.6 Today's clinicians face multiple challenges when it comes to caring for older adults with dementia. Office practice structure frequently includes staff lacking in the necessary knowledge, skills, and confidence to work effectively with cognitively impaired patients and the associated needs of both patient and family. Family and caregiver issues can create an inordinate amount of work for staff due to frequent phone calls, missed appointments, and the basic logistics of office visits. Medicare's reimbursement structure remains an ongoing challenge for primary care providers. In fact, as an Alzheimer's patient visit will invariably focus on the disease itself, the high level of complexity may not be immediately obvious to both clinicians and auditors alike. However, the education and counseling component of evaluation and management coding lends itself well to the appropriate documentation and coding for a visit with a patient with dementia. The new chronic care management codes may also aid in developing the team approach necessary to caring for a patient with Alzheimer's disease. The National Institute on Aging-Alzheimer's Association guidelines provide more clarity to primary care physicians regarding the diagnosis and ongoing approach to treatment of patients with Alzheimer's disease.6 As clear documentation is critical to appropriate coding and billing, the guidelines contribute to achieving this. Furthermore, they highlight the need for regular follow-up and management of patients with Alzheimer's disease. Regular follow-up is a key element in improving the overall value, effectiveness, and efficiency of individual visits. Consider the following patient: An 85-year-old white female with a law degree and a passion for reading was brought to her physician's office by her daughter for hip pain following a fall off the curb in her front yard. She lives in a ranch home with her husband, cooks, and does laundry. Medications include hydrochlorothiazide for hypertension, calcium, and vitamin D. The examination revealed moderate trochanteric pain with full range of motion of the hip joint. X-rays were negative for fracture; Tylenol was recommended for moderate pain and Percocet offered for more severe pain. Her daughter wondered whether the medication would cause confusion, stating, "Mom's memory isn't what it used to be" and asked what could be done to reverse her mother's declining cognition over the past two to three years. Further questioning of both the patient and her daughter revealed progressive deficits in short-term memory, specifically with events and dates, as well as disinterest in planning even a simple activity. The patient wrote reminder notes when cooking and cleaning, and on several occasions the daughter had found stovetop burners left on. When asked about the book she was reading in the waiting room, the patient did not know the title and could not recall what it was about, just that "it was interesting." Her speech was intact and there were no changes in behaviors. A depression screen was negative. At present, the diagnosis of Alzheimer's dementia in the office setting is a clinical diagnosis based on the provider's evaluation and judgment. It includes a thorough understanding of the course and nature of the memory decline as well as an exclusion of reversible causes of memory impairment. Assessment of a patient's memory and function should go beyond patient history and include interviewing the family and other caregivers who are more astute at identifying subtle changes from the patient's baseline. Either a noncontrast CT or MRI scan is appropriate in the evaluation of dementia patients to rule out dementia masqueraders such as subdural hematomas, tumors, vascular lesions, and normal pressure hydocephalus.7 These scans are most useful for new-onset dementia or when focal findings are present on the neurological exam, and less useful for dementia that has a gradual onset, is more than three years in duration, or has an associated Folstein Mini-Mental Status Exam (MMSE) score of <15/30 points. Current guidelines do not recommend routine use of linear or volumetric MR or CT measurement, SPECT, or PET imaging.7 Additionally, apolipoprotein E genotyping for patients with suspected Alzheimer's dementia is not recommended.7 Ongoing research is needed to study these latter evaluations in Alzheimer's dementia diagnosis. When a thorough history and exam, along with the recommended laboratory evaluation and imaging, fail to explain a patient's cognitive impairment, Alzheimer's dementia should be entertained. There are a number of key elements that need to be demonstrated for this diagnosis. First, there should be evidence that cognitive changes interfere with the patient's function. There must also be an obvious decline from a previous functional level. The diagnosis should also not be explained by delirium or another psychiatric disorder. Cognitive impairment should be demonstrated through both history and objective assessment. The most widely studied reliable screening test of cognitive dysfunction is the MMSE and an abnormal test is reported as <24-25 of 30 points.1 Drawbacks from using this test include the fact that it is proprietary and therefore not free. Alternative assessments of cognition are numerous and include the Mini-Cog, Memory Impairment Screen, General Practitioner Assessment of Cognition, St. Louis University Mental Status exam, and the Montreal Cognitive Assessment. There is no single best brief assessment for cognitive function, and clinicians should choose their preferred tool(s) to comply with the Medicare annual wellness benefit's detection of cognitive impairment and train staff to administer the tools. There need to be deficits in two of the five key domains to make a clinical diagnosis of Alzheimer's dementia.7 The first domain is the ability to acquire and remember new information. This can be evaluated with historical evidence such as repetitive questions or conversations, misplacing personal belongings, forgetting events or appointments, and getting lost on a familiar route. Testing three-word recall or other types of short-term memory testing are effective objective measures to test this domain. The second domain is executive function. Historical evidence includes poor understanding of safety risks, inability to manage finances, poor decision-making ability, and inability to plan complex or sequential activities. The third domain includes visuospatial abilities, which can present as the inability to recognize faces or common objects or to find objects in direct view despite good acuity. Clock drawing and copying intersecting pentagons are methods of testing for this deficit. The fourth domain is language function. This can manifest itself via speaking, reading, and writing difficulties. Patients may show difficulty or hesitation when thinking of common words while speaking. It can also manifest itself in speech, spelling, and writing errors. The fifth domain is personality, behavior, or comportment. Changes in this domain include uncharacteristic mood fluctuations often manifesting as agitation, impaired motivation, apathy, or lack of initiative. Patients may show a loss of drive, be socially withdrawn, or have a decreased interest in activities in which they had previously participated. Loss of empathy or compulsive and obsessive behaviors are other manifestations. Finally, socially unacceptable behaviors present further evidence of changes in this domain. Returning to our patient, her office history and physical examination, TSH, vitamin B12, comprehensive metabolic panel, CBC, UA, and noncontrasted head CT scan were unrevealing. MMSE was 19. She demonstrated deficits in three domains: memory, executive function, and visuospatial abilities. A diagnosis of Alzheimer's dementia was clinically established. This brings us to the role of the primary care clinician in the ongoing management of patients with Alzheimer's dementia. Nowhere is the art of medicine more necessary than at this point in time. In the early stages of clinically diagnosed Alzheimer's dementia, there remain opportunities to gather information from patients about their future wishes. This must be accomplished in a very sensitive fashion that doesn't increase anxiety. When this can't be effectively accomplished, it is important to discern the patient's goals and wishes from family members' and caregivers' wishes. The question must always be posed from the patient's perspective. With that said, it is also important for the clinician to ascertain what is important to family members. The overall principles of treatment are to maximize patients' quality of life, promote decision making and planning, maintain independence, delay institutionalization, and lessen the burden on caregivers. Management should first focus on optimizing both physical and mental health function. This involves treating coexisting diseases and cardiovascular risks of vascular dementia. Unnecessary sedatives and hypnotics should be avoided as these can oversedate, cause paradoxical agitation, or worsen both cognitive and behavior deficits. Providers should discuss nutritional approaches, including supplements. Cognitive therapies, as well as both mental and physical exercises should be considered. A recently described approach by Bredesen focuses on diet and exercise to improve cognitive decline.9 It makes sense to incorporate such dietary and lifestyle changes in the health promotion and disease prevention approach to patient care. In the ongoing struggle providers face to find ways to incorporate such important items in a visit and to obtain adequate compensation, time-based coding once again allows for the education and counseling that is necessary for this approach to care. Management of Alzheimer's dementia should next focus on essential education and supports for the patient, family, and caregivers. Caregiver training includes looking for signs and symptoms of both disease progression and the onset of depression. For the more highly educated patient, they or their loved ones may notice subtle changes in executive function and high-level thinking such as a decline in the ability to do crossword puzzles. Discussion of the myriad behavioral changes, including paranoid delusions, agitation, and combative behavior, may reduce worry and feelings of helplessness in caregivers. Referral to the local Alzheimer's Association offers a valuable support for families that can provide assistance in anticipating and planning for future problems. Taking appropriate measures in fall prevention and addressing driving abilities are important conversations that should include both patient and family. Again, the clinician has the opportunity to utilize time-based coding to educate and counsel patients and families—with the patient in the room—regarding all of the above. Patients and families invariably inquire about pharmacologic treatments for Alzheimer's dementia. In a systematic review by the USPSTF, treatment with both the acetyl-cholinesterase inhibitors (AChEIs) and memantine resulted in a statistically significant improvement in measures of cognition and global assessment, yet the clinical importance of this improvement is controversial.1,3,10 It is currently recommended to consider AChEIs to delay cognitive decline in early to moderate dementia, with 54 trials reviewed, and to consider memantine to delay cognitive and functional decline in moderate to advanced dementia, with 10 trials reviewed. Primary care providers should monitor the status of a patient with Alzheimer's disease every three months. Clinicians should keep up with opportunities for new clinical trials, as patients and families will often be quite interested. In summary, the current diagnosis of Alzheimer's dementia is based on clinical judgment, informed by minimal laboratory and imaging evaluation, and in concert with the evidence-based guidelines from the Alzheimer's Association, the USPSTF, and the National Institute on Aging. 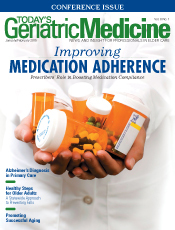 These guidelines, along with evidence-based effectiveness of pharmacologic and nonpharmacologic interventions, will remain cornerstones for the management of cognitive impairment while rigorous research expands and advances our understanding of this disease. The 2014 USPSTF recommendation conflicts with the screening requirements of the Medicare annual wellness visit. Nevertheless, there is a demographic imperative that assures us Alzheimer's disease will continue to be a significant clinical issue in the years to come and warrants the full attention and responsiveness of the health care industry. The new clinical guidelines provide a roadmap for how clinicians should approach the diagnosis and management of dementia and intervene in ways that will help to maximize patients' quality of life while helping families plan, prepare for, and cope with the symptoms of dementia. — Michael Wasserman, MD, a geriatrician in Woodland Hills, California, cofounded Senior Care of Colorado in 2001. Previously the president and chief medical officer for GeriMed of America, a geriatric medical management company, he helped to develop GeriMed's Clinical Glidepaths. He was a cofounder and owner of Common Sense Medical Management, a case management company that helped manage high-risk beneficiaries for Cover Colorado, and was a cofounder of MESA (Medicare Experts and Senior Access), a multiyear grant from the Colorado Health Foundation to train primary care physicians in how to effectively care for and bill for Medicare patients. — Debra Parsons, MD, FACP, a practicing internist-geriatrician, is medical director of the Regional Care Collaborative Organization at Colorado Access and a clinical professor in the department of medicine at the University of Colorado School of Medicine. 1. Moyer VA. Screening for cognitive impairment in older adults; U.S. Preventive Services Task Force recommendation statement. Ann Intern Med. 2014;160(11):791-797. 2. Alzheimer's Association. 2011 Alzheimer's disease facts and figures. Alzheimers Dement. 2011;7(2):208-244. 3. Lin JS, O'Connor E, Rossom RC, Perdue LA, Eckstrom E. Screening for cognitive impairment in older adults: a systematic review for the U.S. Preventive Services Task Force. Ann Intern Med. 2013;159(9):601-612. 4. Boustani M, Peterson B, Hanson L, Harris R, Lohr KN. Screening for dementia in primary care: a summary of the evidence for the U.S. Preventive Services Task Force. Ann Intern Med. 2003;138(11):927-937. 5. Cordell CB, Borson S, Boustani M, et al. Alzheimer's Association recommendations for operationalizing the detection of cognitive impairment during the Medicare Annual Wellness Visit in a primary care setting. Alzheimers Dement. 2013;9(2):141-150. 6. Hyman BT, Phelps CH, Beach TG, et al. National Institute on Aging–Alzheimer's Association guidelines for the neuropathologic assessment of Alzheimer's disease. Alzheimers Dement. 2012;8(1):1-13. 7. Knopman DS, DeKosky ST, Cummings JL, et al. Practice parameter: diagnosis of dementia (an evidence-based review). Report of the Quality Standards Subcommittee of the American Academy of Neurology. Neurology. 2001;56(9):1143-1153. 8. Phelan E, Williams B, Meeker K, et al. A study of the diagnostic accuracy of the PHQ-9 in primary care elderly. BMC Fam Pract. 2010;11:63. 9. Bredesen DE. Reversal of cognitive decline: a novel therapeutic program. Aging (Albany NY). 2014;6(9):707-717. 10. Raina P, Santaguida P, Ismaila A, et al. Effectiveness of cholinesterase inhibitors and memantine for treating dementia: evidence review for a clinical practice guideline. Ann Intern Med. 2008;148(5):379-397.